As several people have pointed out on various forums and builds, the nose cone on the DiAgostini is a bit off. I won't go into all of the details about what's wrong, or why it probably ended up that way. Frankly, 99% of the population wouldn't even notice it... at least not consciously. Unlike other inaccuracies, this one may create a subtle sense of unease in people. It changes the profile, and means the images from inside the cockpit don't match the exterior. So, some fans may say something along the lines of "it's not quite right." Don't get me wrong, there are several inaccuracies in the model, and most really don't matter (although I'm likely to fix a few more along the way). This one, however, is a bit more bothersome. In the end, I think the modified nose is both more beholden to the original inspiration (B-29 bomber cockpit), will fit the modified cockpit pieces much better by allowing the side consoles ride a bit higher, and just looks slicker. The lower windows are too wide by about 3.75mm. This also pushes the panel line too low. The lower two windows are also too large. All four of these front windows should be the same size. Cleaning up the seams around these three pieces took more effort than I expected. However, it's still much better than the original mold, which I understand was quickly replaced with this design. Even though the base cone doesn't look bad after fixing the seams, it still bothered me... so, it was time to start modifying things a bit. 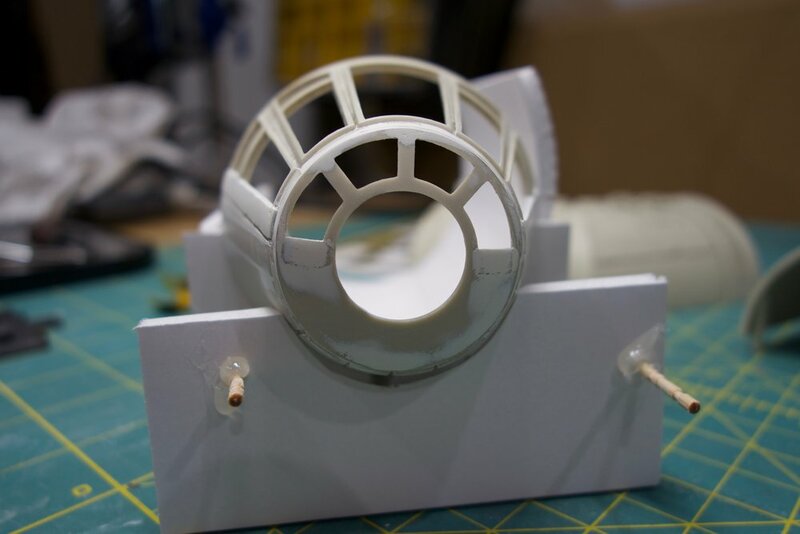 First, I cut many small styrene strips, which stack up to ~3.75mm (5x of .75mm thick strips). The stacks were glued together and trimmed down to fit appropriately. Then, the stacks were glued into their respective windows to tighten up the spacing. 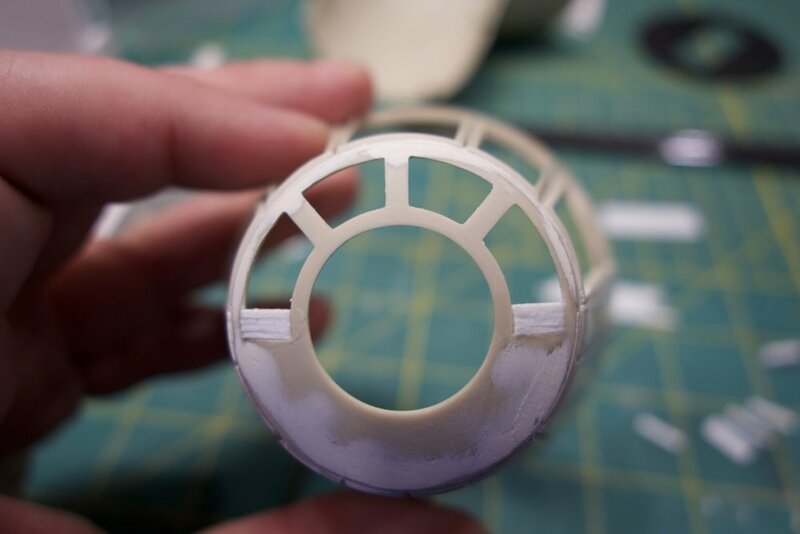 Additional styrene strips were needed before and after the windows on the sides to shift the panels and panel lines appropriately. I found the bottom of the base window mold was pretty close to where that panel line should go, so I just left that as a foundation for scribing the panel line later. I used a bit of epoxy to start filling in the gaps and old panel lines, while slightly reinforcing the stacked styrene. At this point, I think the window shapes look a bit better, and the entire nose cone feels better. Maybe I've just stared at the thing too long. In the process of test fitting the cockpit parts, I found the modifications planned left me with a bit of exposed lip on both the cone and the tubing connecting the cone. These are some spare photoetch parts I have from a 1701 refit build. It'll become more obvious why when we get to assembling the cockpit, but I cut up the photo etch and added some around the inner lip of the cone. Assuming I've done the math correctly, this should give just a bit of character while covering the offending areas that won't be covered by other instruments already. 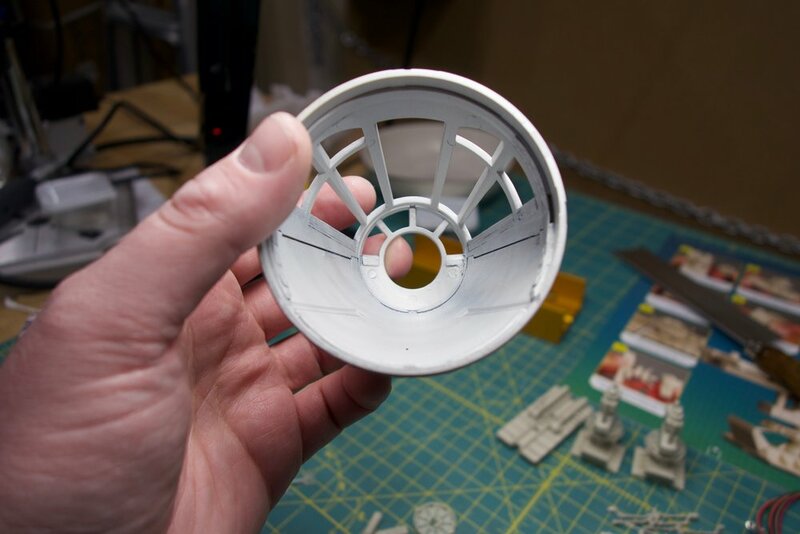 Even though the 1701 is 1/350 scale and this is closer to 1/48 on the interior, it's not too far off what we see on screen. Additional filler, sanding, a bit of primer, and more wet sanding. It's a slow process, but the shape finally start to look right. Another pass with primer, and it's looking pretty good. From the front it's nearly impossible to see anything indicating this was ever less than one piece. A little touchup is still needed on the sides, but this is getting quite close as well. I also hit the inner details with some primer. I'll add a couple coats of black to light block the inside as well, before hitting it with the base coat. It'll nearly all be covered up with the cockpit details, but I want the base coat on the inside and outside of the window frames. After pre-shadowing, I hit it with the base coat of Insignia White. Maybe a couple very minor imperfections, but they'll easily be covered with weathering. All in all, I'm quite happy with the result. Completed modification after pre-shadowing and a base coat of paint. Little touchup and weathering is still needed. From the inside you can see the completed look better matches what you see on screen. The side panels will come up to the bottom edge of the side windows. Now that the cone is done, I need to make more progress on the cockpit details that go into the cone. 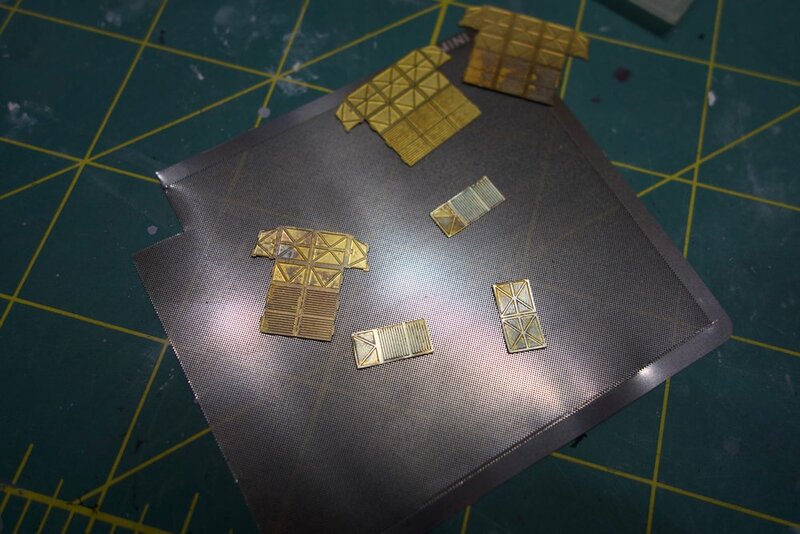 This includes photoetch, 3D printed pieces, and an absurd amount of fiber optics. Painting has already begun on this, but it'll probably be a couple weeks before I have made enough progress to share. Between now and then, I'll share some of the progress being made on the ramp and lower haul. Part of the reason I'm working those in parallel is to determine exactly how long the fiber optic needs to be to reach from the cockpit to where I plan to house an 8x8 RGBW LED grid. This grid will drive the interior lights on consoles, etc.